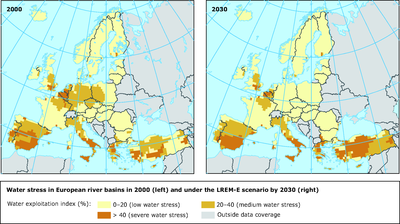 Europe's water resources are increasingly under stress, characterised by a mismatch of demand for, and availability of, water resources across time and geographical space (EEA, 2009). Poor or unsuitable water quality often further reduces availability, restricts uses, and increases the costs of supply. Regions with low rainfall and high population density are prone to water stress as well as areas with intense agricultural, industrial or tourism activities. Global climate change is already exacerbating these problems with projections indicating significant and widespread impacts over the medium to long term (IPCC, 2007). These developments will inevitably lead to growing competition between different water use sectors, with high quality resources being protected and reserved for drinking water production. Europe's water resources are increasingly under stress, characterised by a mismatch of demand for, and availability of, water resources across time and geographical space (EEA, 2009). Poor or unsuitable water quality often further reduces availability, restricts uses, and increases the costs of supply. Regions with low rainfall and high population density are prone to water stress as well as areas with intense agricultural, industrial or tourism activities. Global climate change is already exacerbating these problems with projections indicating significant and widespread impacts over the medium to long term (IPCC, 2007). These developments will inevitably lead to growing competition between different water use sectors, with high quality resources being protected and reserved for drinking water production. These pressures have encouraged more active consideration of alternative water sources as a strategic option to supplement water supplies and protect natural resources. Recognition of the potential role of water reuse in such a strategy is now well embedded within both European and national policy communities. Indeed recent years has seen a sense of urgency in calls for water reuse to become more widespread. It is the top listed priority area in the recently published Strategic Implementation Plan of the European Innovation Partnership Water which drew attention to ‘limited institutional capacity to formulate and institutionalize recycling and reuse measures, a lack of financial incentives for reuse schemes, and poor public perceptions towards water reuse’. In a similar vein, maximisation of water reuse is a specific objective of the European Blueprint for Water (COM(2012) 673) with a proposal for development of a regulatory instrument on standards for water re-use anticipated by 2015. The published report on water reuse by the Water Supply and Sanitation Technology Platform notes that ‘Although investors and water utilities are becoming increasingly enthusiastic about water reuse … the capability of Europe's water sector to deliver reuse projects is being compromised by a lack of suitable regulation, skills and public understanding’. This report also notes that ‘with appropriate investment in people, knowledge, and technology, Europe could be a global leader in this rapidly developing market.’ and highlights the ‘huge eco-innovation potential in terms of technologies and services around water recycling in industry, agriculture and urban water systems’. (ii) to create a unified professional identity for the European Water Reuse sector. DEMOWARE has been developed through close collaboration between SMEs (many of which are research active), major industrial players in the European reuse sector, and several of Europe’s leading water reuse research institutions. It has also been informed by both European and national level studies as well as by consultation with major stakeholders such as the European Water Supply and Sanitation Technology Platform (WssTP) and water service & equipment providers who all urge greater coordination of efforts to overcome the barriers which constrain the emergence of a vibrant European water reuse sector.